I picked this book up thinking it would be a quick read. It was, but that doesn’t mean it’s a book I won’t be thinking about for a long time afterwards. My interest in Science is minimal, and I confess that anything linked to what I called “hard maths” (i.e. physics) in school still leaves me cold. So why did I find myself walking down the road with my head in this book desperate to finish it? It is, basically, a book I fell in love with. Named after his parents’ favourite scientists, Albie Bright is a boy that I immediately warmed to. When we first meet him he and his father are adjusting to life without Mrs Bright, who died of cancer just two weeks earlier. Neither Albie or his father are really doing anything other than existing at the start of the novel, and Albie’s questions about what exactly has happened to his mother would – I suppose – be of comfort to any child in similar circumstances. Due to the fact that Albie’s parents have always encouraged his natural curiosity, his father’s reluctance to talk to Albie about what has happened shows the depth of emotion these characters are feeling. Rather than dwelling on this however – which I imagine could have been very depressing – Edge takes us in a totally different direction. When Albie’s father tries to comfort his son, things don’t quite go as you’d expect. 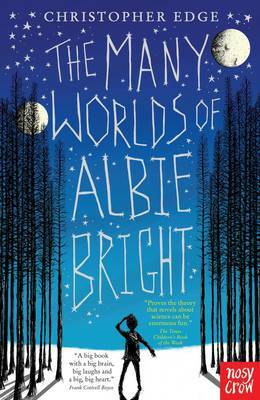 Using quantum physics to explain that if there are parallel universes there is the possibility that, somewhere, Albie’s mother is still alive creates a sense of hope in Albie that, while naïve, is touching to watch. Fired up with determination to find his mother again, Albie creates Quantum Banana Theory which allows him to travel to a parallel universe. This is the point at which we are well and truly in the realm of the fantastical. I found myself laughing at some of the scenes that we get to witness, but throughout there was a thoughtful exploration of Albie’s feelings and a clear focus on showing us just what Albie in each parallel universe gained, and lost. I loved how we got to see Albie slowly come to the realisation that you have to live with what you’ve got and make the most of it. I can’t wait to see what the students who select this under the BookBuzz scheme make of this one.